The weather has finally caught up with my insistent demands for the fall season and it looks like there is cool, crisp weekend in store. I also have a very, very busy weekend to follow my very busy week which means that I needed to do some serious make-ahead, grab-and-go food for the weekend. I already whipped up a large pot of vegetable soup this week that has been my lunch every day this week (and I still have a large container left in the fridge and four individual servings frozen). I had planned on posting that recipe since it is really tasty but then wedding planning took over my life, my pup got very very sick, and work came home with me nearly every day so it didn't happen. The chaos of this month and the impending chaos of next month has worn me out. To say that I need something comforting is an understatement. Apparently, my body is interpreting this as a craving for a thick slice of quick bread with butter. I didn't do much baking this summer, and now all I want to do is bake - I'm blaming it on the cooler weather. After making these pumpkin whoopie pies last week, I've had all sorts of baked goods on the brain. Pinterest is only adding fuel to this fire and making me wish I could spend days in the kitchen. The other day, while furiously pinning gorgeous dresses and boots that I'm pretty sure I need, I saw a picture of a humble loaf of banana bread. After that, I could not get banana bread out of my head. Luckily, there have been a small batch of ever ripening bananas staring at me for a few days and I figured baking some banana bread would put them to good use. Banana bread has always been a favorite of mine for so many reasons. For one, it makes your house smell ah-mazing. Secondly, it is the perfect vehicle for butter, nut butters, and cream cheese (if you haven't tried that, do it. now. It's life-changing). Thirdly, it makes an awesome grab-and-go breakfast on hectic fall days. But my top reason? It reminds me of baking with my mom. My mom and I would always make the best banana bread together and I can't help but smile when I make it. Just the smell of banana bread is enough to send me into nostalgia land and provides a warm, buttery blanket of comfort for me. 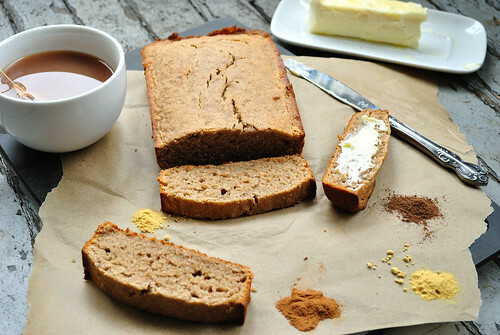 So if you need some comfort or just a quick grab-and-go breakfast for your hectic weekend, whip up some banana bread. 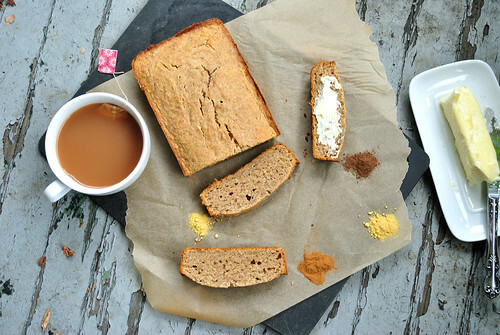 This bread is sprinkled with a bit of chai spices that take the comfort to a whole new level. 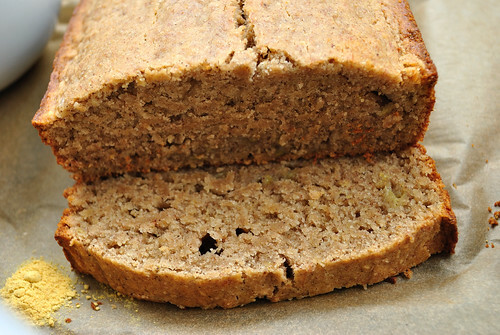 It's also vegan simply because my favorite banana bread recipe just so happens to be vegan. 1. Preheat oven to 350F and oil your loaf pan. 2. Mash bananas until they are very liquidy. Add in vanilla, sugar, syrup, and coconut oil. Whisk until combined. 3. In a separate bowl, add remaining dry ingredients (flour, spices, salt) and whisk together until they are fully incorporated. 4. Combine wet and dry ingredients until just mixed. 5. Bake in loaf pan for 45-50 min until toothpick inserted comes out clean. 6. Let cool on a cooling rack for 20-30 minutes before removing from loaf pan. Once removed, let cool completely before slicing.